Learn How To Easily Change Front Tubeless tires On A Street Bike! Most of us know how easy it is to change the tires on our cars, but many may not know how to change the tires on their motorcycle! Fortunately in this video we get to see a step By step DIY tutorial video on changing front tubeless tires on a street bike! You’ll get to see just how easy it is to put on a brand new motorbike tire by first breaking the bead of the tire without using tire changer, tire machine, or any other expensive extra special tools to remove old tire! Learn to install motorcycle and dirt bike tires on Honda, Suzuki, Kawasaki, Yamaha, Buell and Harley Davidson motorcycles by hand and by yourself! Not only will it save you money, but it will also leave you feeling good about your motorcycle maintenance skills! 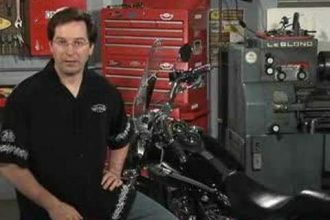 This tech tip & trick works for installing both front and rear motorcycle tubeless tires. To check out the step by step tutorial click the video below! Check Out These Handy Tips To Maintain Your Motorcycle!